Engine charts are small charts that are visible in the Engine – for example Heap memory chart or Average strategies per hour chart. As same as most of the things in SQ X, these charts are implemented using Snippets, which means they are extendable – you can add your own chart there. Click on the Code editor icon to switch to Editor. There is no wizard ofr engine charts yet, but you can easily clone an existing snippet and modify it to display accepted strategies per hour. In the Navigator tree on the right go to Snippets -> SQ -> Engine charts, then click on the AverageStrategiesPerHour.java with right mouse button, and choose Clone. Name the new file AcceptedStrategiesPerHour. This will create a cop of the existing snippet that displays average strategies per hour. 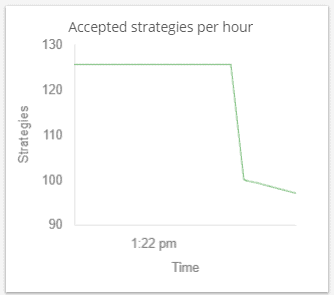 Now we only have to modify it to display accepted strategies per hour instead or average. There isn’t actually much to modify – we’ll modify the obvious, like snippet and chart name, and the only method that needs to be modified is method addNextValue() where the next value for the chart is set. We were lucky with this snippet, because SQ already computes this statistics, so we only have to create a new chart that uses it.